It all started in 1935 in Lickskillet, Kentucky, where Dale Sanders was born on the banks of the Whippoorwill Creek. A typical day of leisure in his early years was spent in the waters and woods adjoin-ing his parents’ tobacco farm. He added acrobatics to his outdoor skills, and also found himself to be a proficient swimmer. “My LOVE for the water actually began as a child on the banks of the Whippoorwill Creek. Being the smallest kid at school, those days meant you were bullied. I learned quickly, everyone is the same size in the water. When it come to de-fense I got pretty good at it. My underwater abilities became honed at an early age. I developed underwater disappear-ance and breath holding skills to a level not seemingly pos-sible to the folks living the back woods areas of Kentucky. Fortunate, I was able to apply my aquatic background to wa-ter safety employment and payment for doing simply what enjoyed. By the time I joined the US Navy in 1958, a carer in aquatics was destined. My true spearfishing aspirations were not fully developed though until after I joined the Navy. The military was good for me, actually helped me launch my spearfishing career. Being an aquatic manager at the Naval Hospital in the San Francisco Bay area I was able to be-friend the leading California spear-fishermen of those days. 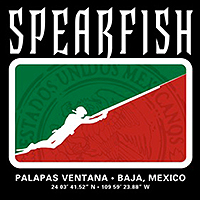 My very first spearfishing meet, I remember very well. I actually took second place to southern California’s Jay Riffe, the inventor of the “Riffe’s Reel”. The tournament was at Anchor Bay, north of San Francisco. Interestingly, I would have taken first place had my largest Rock Fish, a big Red Snapper, not been disqualified. I had one Rock Fish too many, a lesson learned. Never again was I disqualified for violating regulations. How-ever, years later, I was the only diver near when Bob McGuire accidentally shot himself in the leg with a five point spear head. Bob always maintained, he refused to allow me to es-cort him back to the staging area. I went on to win first place in that event and with Bob’s help, became a skilled free-diver. As Bob I too, entered the Park and Recreation profession. My early spearfishing tenure was cut short when the Navy transferred me to field Med School and a tour of duty with the Marine Corpse in Okinawa. Fortunately, I was placed in charge of the Third Marine Division sport diving program. On my return to the San Francisco Bay Area, with speargun in hand, I was prime, an expert marksman, ready to apply my skills to real growth and development in the sport. 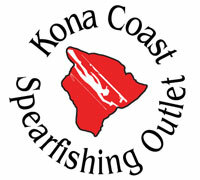 I started competing and winning at high level in the central west coast spearfishing competitive programs. 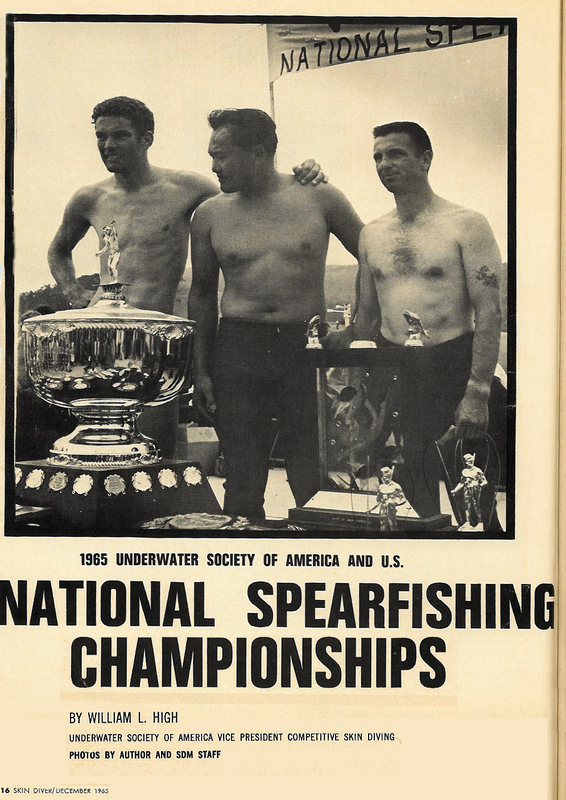 In 1963, most spearfishing tournaments entered I won. By 1964 – 65, from what I can remember, awards receiver were: Central California Diver of the Year, California Fresh Water Champion, California-Oregon Championships, 1965 USA Na-tionals, Underwater Society of America Nationals and the ac-claimed Spearfishing “Athlete of the Year Award for the Unit-ed States”, I will always be thankful to the west coast spear-fishing community for giving this opportunity. 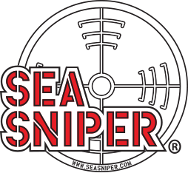 I would be re-miss by not mentioning some of the folks that made my spearfishing career a success: Roger Chung, the truly un-sung hero, Don Thompson, Archie Waterbury, Hal Jorgen-sen, Don Barthman, Bob McGuire, Harry Hague, Terry Maas, Bob Hayes, Al Giddings, the Asturias Brothers, Oscar and Ralph, Don Ferrin, Carl Kruspansky, Al Ellis, The Bouer Brothers, Carl Wood and Don Gastineau of the State Fish and Game Department and of course many others. I thank each of you from the bottom of my heart. May God be with you my spearfishing brothers. A special thanks goes to Roger Chung, my friend, my mentor and my team mate. Dale’s first real job was lifeguarding on Kentucky Lake. 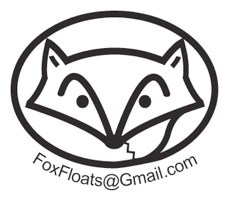 There, he launched his professional career, teaching swimming, first aid small craft. During this period, he certified thousands through these American Red Cross programs. His quest to be one with the water and it’s environment continued growing into his early 20’s and in 1958 influenced him to join the US Navy. During this period, he also became a Navy Hospital Corpsman, Hard Hat Deep Sea Diver and served with the US Maine Corps in Okinawa. 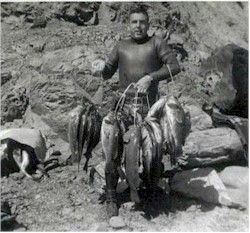 By the mid 1960’s, Dale was nationally recognized through competitive sports such as swimming, diving and spearfishing. He also started a SCUBA commercial driving and underwater services company, all of which helped launch his life-long career in the field of Park and Recreation. His first big travel adventure were with his wife Meriam. In 1983, the couple made a backpacking trip around the world. They passed through 26 countries, walking wherever possible, using commercial transportation only when necessary. Dale’s thirst for adventure has never settled, but only contin-ued to grow over the years. He is the only person known to have paddled (dragged where impossible to paddle) his canoe the entire length of Tennessee’s Wolf River from its source to the Mississippi River in one continuous trip. Dale has hiked several of the south-west US canyon land landscapes. A recent adventure was a Rim to Rim, Grand Canyon hike from north to south, across the Colorado River and out the Bright Angel Trail — a challenge only a handful of 80-year-olds have accomplished. He says his most memorable adventure was paddling the full length of the Mississippi River from Source to Sea at 80 years old in 80 days, in support of Juvenile Diabetes research. He claims to have set an age-based world record for this expedition and he chal-lenges older paddlers to better this accomplishment. Close behind in second most memorable he became the oldest person at 81 years old to paddle the grueling MR-340 race when he teamed up with two fellow paddlers and completed this 340 mile paddle across the State of Missouri in 79 hours. He said this was actually the phys-ically hardest thing he have ever done in his entire life. 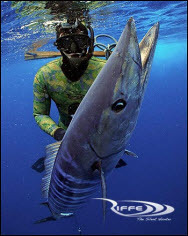 Dale’s national and international titles include the prestigious Athlete of the Year award from the International Underwater Spear-fishing Association, a record for Underwater Breath Holding and numerous U.S. national / southeast Asian team and individual spearfishing awards. He received the esteemed individual USA Na-tionals Sports Foundation award for Excellence in Parks and Rec-reation. His aquatic certifications included skin and SCUBA diving by the YMCA, NAUI, US Marine Corps and PADI, where he became a teacher and Instructor Trainer (IT). As staff member to three Ameri-can Red Cross aquatic schools he also became an IT in water safe-ty, first aid and small craft. Dale is retired from a successful career in Parks and Recrea-tion. For nearly six decades, he worked full time in the profession — including 37 years with the Department of the Navy. He holds a Masters Degree from Pepperdine University in Malibu, California and continued his post graduate education in Morale, Welfare, Recrea-tion and Parks until he retired in 2002. Following his formal retirement, Dale’s hobby became River Guide for the Memphis, Tennessee based Wolf River Conservancy. He regularly volunteered for the Conservancy until he joined their staff as the Director of Outreach in 2013. He is the recipient of the Canoe and Kayak Magazine “Spirit of Adventure Award”, becoming the oldest person to ever paddle the Mississippi River from Source to Sea. His Memphis-area home has become a favorite stopping and re-supply destination for long distance paddlers. He welcomes ca-noe and kayakers passing through to sign and add artwork to a wall at his house, a self-declared Paddlers Wall of Fame. Online and in-person, Dale is often referred to as “River Angel” or “Grey Beard”. Plans are underway for an attempt to hiking the entire 2,190-mile long Appalachian Trail. If he succeeds, he could become the oldest person to complete this journey in one season. He will be 82 when the last step is taken onto Mt. Katahdin, the northern trail head of this the worlds longest foot trail in the world. Although he is quick to give credit for his excellent health to God and lifestyle, he realizes an aggressive role in outdoor activities is an essential part of meet-ing the physical challenges that lie ahead. A final note of interest – Frank and Jessie James parents were also born and raised in Lickskillet, and yes, they were related to Dale’s side of the Sanders family.